Cajun Rollergirls are No. 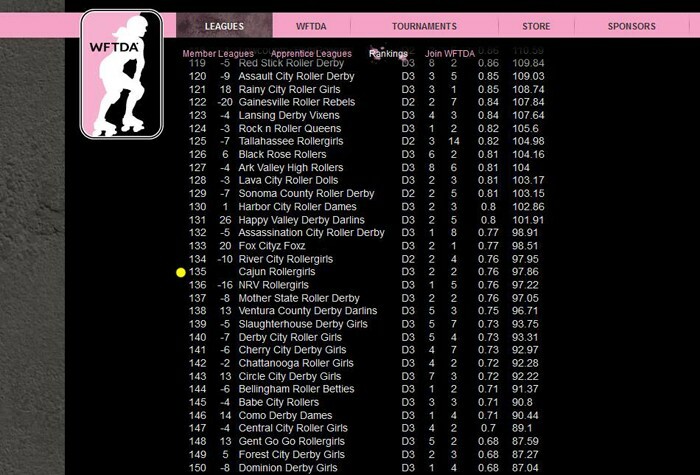 135 in WFTDA!! It’s official, CRG Nation – your Cajun Rollergirls are officially ranked by the WFTDA for the FIRST TIME EVER! In the newest rankings released today, we stand at No. 135 IN THE WORLD! We’re absolutely ecstatic about this honor, which is a direct reflection of how hard we’ve worked and how far we’ve come since our humble beginnings. Thanks to everyone who has supported us and helped us get to where we are today, and you know we’ll continue to work even harder to make that ranking even higher! Cajun Rollergirls at 2014 Running of the Bulls	CRG in The Houma Courier!